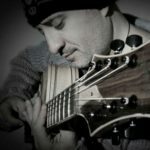 A sequel to John’s excellent initial Exploring Original Creations [Non-Diatonic] masterclass, this new masterclass will help you discover colorful rich voicings, expand your ears and develop your solo guitar skills. Although learning voicings separately is important, nothing beats hearing (and understanding) how a master applies challenging ear (and finger) stretching sounds in a musical context. John Stowell shares insights on how he creates harmonically dense and beautiful original compositions. This is not to just teach you cool chord voicings but to give you the tools for you to use in your own performances. By learning John’s pieces, you will be able to quickly digest many chords in context so that you can apply them in your compositions and arrangements. Every chord voicing, double stop and single note is explained and broken down so that you know where each note comes from. John is a patient and dedicated educator who shares his thought process for these three beautiful pieces. In addition to explaining how he performs each piece as a solo guitar piece (using his signature pianistic approach), he also performs an improvisation on the blowing changes. These soloing chord changes are also included so you can see how John simplifies the chord progression so that the piece is more friendly for soloing. If you’d like to start including more modern harmonic colors in your playing, this is a great masterclass for you.